The solution is the sum of a company’s systems, applications and processes. It acts as a container for versions (branches) of solution documentation, one of which is the production version. A branch represents a version of the solution documentation containing processes, libraries, and systems. 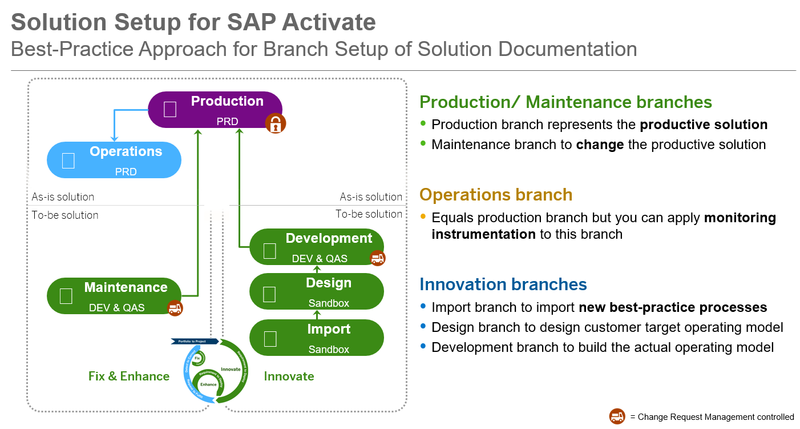 Branches are used to separate different versions of solution documentation content: Branches are the linchpin of the SAP Solution Manager content lifecycle concept. They control the visibility and changeability of solution documentation content. By default, when you create a solution, there will be a production and a maintenance branch. While the production branch only contains productive documentation, the maintenance branch offers a version of solution documentation content in a staging area to maintain the solution documentation without any interference with productive content. The branch setup allows you to clearly differentiate between solution documentation content that is productive and content that is still work in progress. • Development branch to build the actual solution. To control the changes to the process models (definition of processes, process steps and process flows) during the project implementation it is recommended to do those activities only in the Design branch. After the process definition is finalized, the processes can be released to the Development branch. In the Development branch further documentation (e.g. functional and technical specifications can be created/uploaded and the objects (e.g. configuration and development items) can be documented. • Creation of design documentation. The access to any branch (e.g. Design or Development) can be limited with authorization objects SM_SDOC and SM_SDOCADM, which are part of the SAP_SM_SL_* authorization roles. • Work in the Development branch. 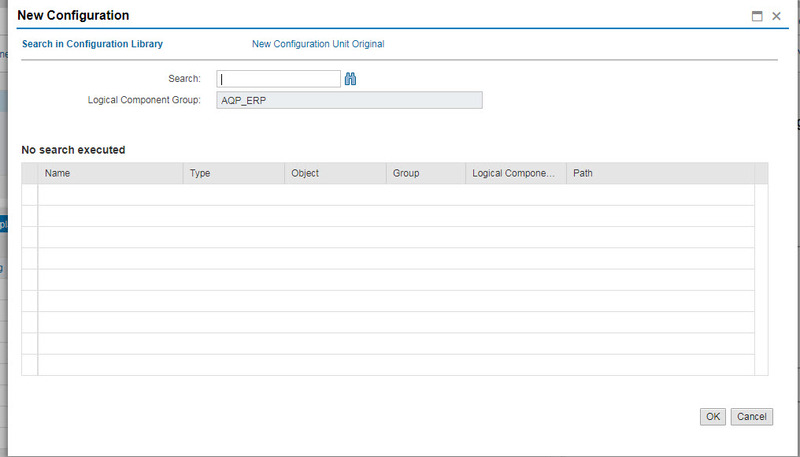 Copy the Role SAP_SM_SL_ADMIN to a customer name space to adjust the authorization. The role SAP_SM_SL_ADMIN is one of the major roles when working with the new Process Management application, transactions SOLADM. It does not contain an authorization object (S_SMDDOC) to work with documents (create or edit). After you assign the modified authorization role to the end user, the user will only be able to access this one solution and this one branch. – Display document types (add/remove from scope only). 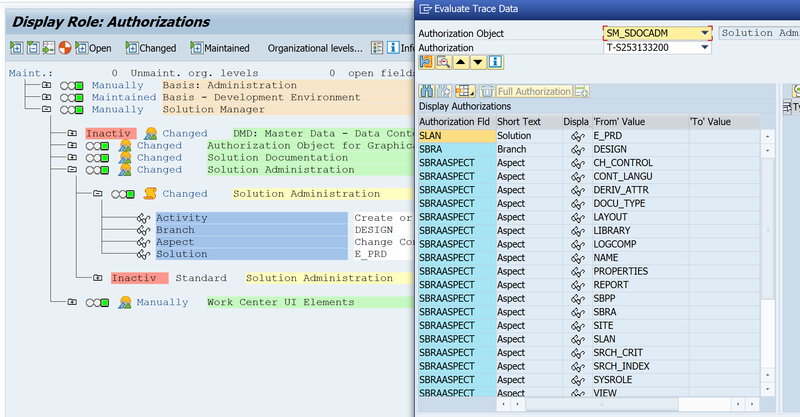 The authorization object SM_SDOCADM is used with a combination of the field SBRAASPECT (Aspect). Display solution administration: A user without display activity cannot enter solution administration at all. Display authorization is only checked against the field SLAN. It is not possible to restrict it on any other aspect. Aspect CH_CONTROL – Change control properties. This aspect controls whether change request management can be activated or deactivated at a branch. Aspect REPORT – Maintaining reports (activities create, change, delete). ACTVT: Activity (display, create, change, delete, activate, assign, maintain, import, export). I created Solution in Solman 7.2 Unfortunately ,the development branch is not visible in solution in soladm.May be authorization problem? the development branch is not created automatically with the solution. Only the maintenance and the production branch are created with the solution. You need to create the development branch underneath the production branch. First, thanks for the Blog on this new authorization object. It help a lot! But … I have tried to limit some function available of the end-user such “create new folder”, “create a new BPMN”, “create/assign a new Developemnt object” … etc. Does these kind of restriction could be setup with these authorization object ? I did not found any. Its EWA’s blog.Since I am new, unfortunately I dont know much.In my Design tab,i cannot edit anything and the list don’t appear. I am sorry that i can’t help you out. Can in Solution Documentation 7.2 replace document templates with other templates of our company? If so, how can this be done? then document administration…copy document types like Z0SAP_20 and upload your template. How to in Solution Documentation to add (create) a role that edited the document (delete, edit, copy) who created your user. And the rest of the documents you had access to edit (delete, change, copy), view only.